Greeting cards help convey short messages, invitations or just remind customers about you. They can be plain with a company image or made using a pre-existing template without many graphics. This is why we offer a wide range of materials, sizes and designs for you to choose from to print your greeting cards. The greeting card paper options we offer are many and include silk, glossy, pearl, oyster, kraft, coated and uncoated and laid papers. We also have various sizes for you to view. If required, we can also create greeting cards using your own customized designs and colours. We offer various types and sized envelopes for you to choose and match or complement with your design and paper. Your greeting cards get a tactile finish with enhanced durability if matte or gloss lamination is added to the print. Complete your greeting card by choosing between a tent fold, long edge or short edge folds. We generally need about a week to print the season greeting cards. While rush deliveries are not taken, they are available at an additional cost. 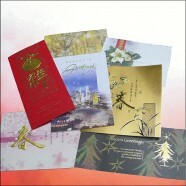 The minimum number of greeting cards we accept per order is 100 greeting cards.